Alexandria Ocasio-Cortez (left) and Ed Markey. Senator Ed Markey is working with Representative Alexandria Ocasio-Cortez on legislation to advance Democrats’ much-discussed “Green New Deal” aimed at fighting climate change while creating jobs, a spokeswoman for Markey’s office confirmed to the Globe this week. No date has been set to unveil the proposal and details are scarce, but the slogan echoes former President Franklin Roosevelt’s sweeping Depression-era economic relief programs. 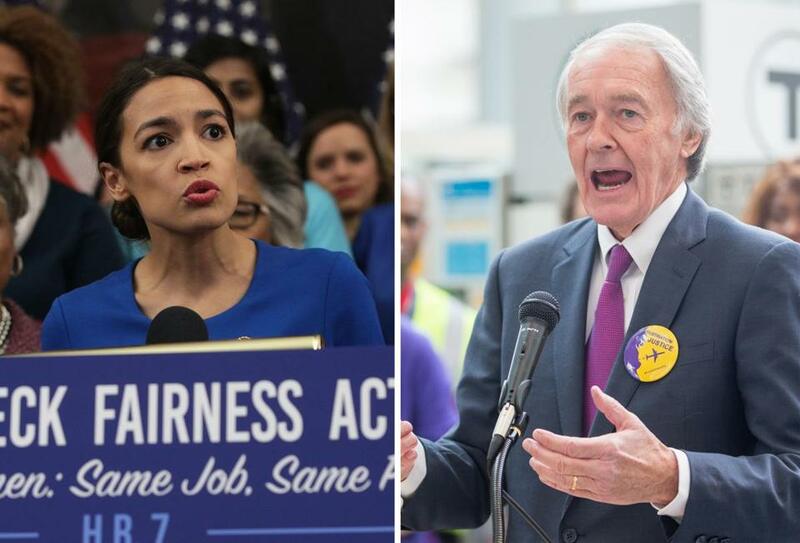 The collaboration between Markey, whose tenure in Congress stretches back decades, and Ocasio-Cortez, a freshman, was first reported by Axios. It’s a step forward on an issue that has become a major talking point for Democrats in the still-emerging 2020 primary field. Democratic 2020 hopefuls Elizabeth Warren, Kirsten Gillibrand, Kamala Harris, and Cory Booker all have thrown initial support behind the idea of such an initiative. Possible candidate Michael Bloomberg said in New Hampshire this week that he supported a “bold and ambitious” plan as long as it was achievable. But despite the apparent coalition, concrete details have not emerged. A draft proposal to create a committee focused on the concept obtained by Axios outlined some ambitious goals: Building capacity to meet 100 percent of United States energy demand using renewable sources; eliminating greenhouse gas emissions from a number of industries; and a federal jobs guarantee, to name a few. But which, if any, of those goals make it into actual legislation remains to be seen. Giselle Barry, a spokeswoman for Markey, noted that text of the legislation is not final. Jess Bidgood of the Globe staff contributed. Christina Prignano can be reached at christina.prignano@globe.com. Follow her on Twitter @cprignano.